Chuck’s prompt is a random phrase generator. 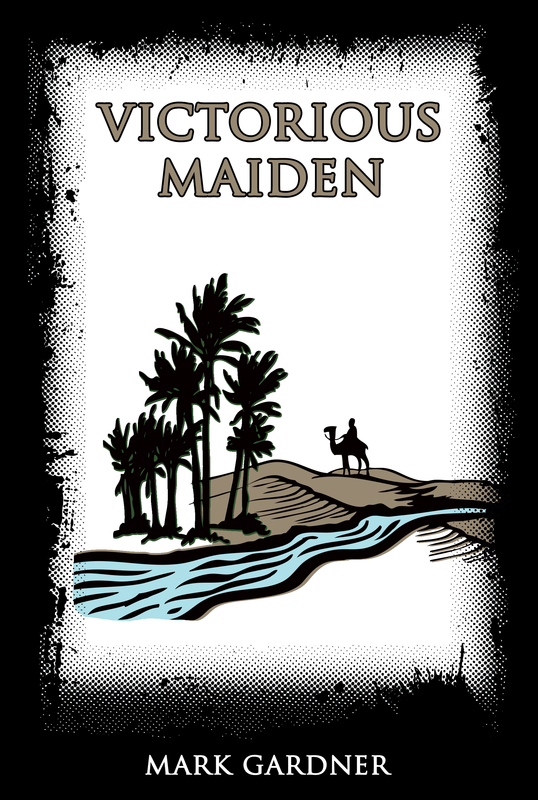 These 890 words bring the total written for Victorious Maiden up to 15,040. Octavius continues to squeeze even after the light is gone from his friend’s eyes. He must be sure that Bacchus is dead for he knows he wouldn’t have the fortitude to try again. Also, it was expected – Octavius had never killed anyone before. The life of a religious man has never involved slaying beasts for food, or even the bothersome pests that lurk about for scraps of food. Until this moment, his thumbs pressing against Octavius’s windpipe, he thought murder to be beyond his skillset. It is a wonder what a subject will do when a Goddess demands something, he thought as he noticed the white lines across his fingers – they began to numb, but his grip remained unbroken. Octavius is finally convinced Bacchus is dead, so he slowly releases the body, and collapses into a heap on the dusty floor. His body shakes with uncontrollable sobs as the reality of the last few minutes sinks in. He has offered Kanoni a life, but not much of a life. Bacchus’s days were mirror images of the past, with no expectation that they would change in the future. It was very possible that Bacchus wouldn’t accomplish anything with the entirety of his existence. These thoughts didn’t change the fact that Bacchus didn’t deserve to be murdered by a man he considered a friend and a brother. Shame begins to overwhelm Octavius. He finds no pride in killing Bacchus. The tremors begin in his still-numb fingers and spread across his body until his entire beimg is shaking. His breath rasps, and he finds it difficult to catch it. A profound loneliness fills him and subsumes to sadness. What have I done? The thought repeats again and again. Octavius whirls and at the site of Goddess Kanoni he prostrates himself at her feet. Octavius dares to look up at his Goddess. She stares at the stained glass depiction of her earthly form, and shakes her head. As her hair moves this way and that, Octavius sees something that stills his soul. Her hair isn’t the dark brown he’s read about in the ancient texts. It is definitely unlike her depiction in the stained glass. It’s too dark, almost black and each tip seems to fade into a tendril of smoke. The false Kanoni warps into thick black smoke, and solidifies into a stunning woman. The elegant curve of her neck, and classically beautiful facial structure is not what caused Octavius to lose his breath. Nor were it the perpetual scowl the woman wore, but her wings of writhing black smoke. “Marquis Oya!” He finally stutters after regaining control of his faculties. Octavius steps back from Marquis Oya. “I have taken Rashid.” Oya steps forward. “I have taken Bacchus.” Another step toward Octavius. Oya’s hair whips to and fro, tendrils striking the walls. Her wings pulse and Octavius is overcome by a strong wind. The hairs on his arms stand at attention. Black smoke seeps out of a wooden dais centered under the stained glass. “No,” whispers Octavius, his mouth forming a worried frown. Octavius recoils from her touch. “You,” Octavius starts, but a lump in his throat prevents the words from continuing. Octavius breaks from her grasp and staggers back into the middle of the sanctuary. “You will never take me,” he screams and picks up a shard of the destroyed dais. He plunges the wood into his chest; floor, hands and torso sharing the spilling of his own blood. This entry was posted on Friday, July 17th, 2015 at 08:25	and tagged with terribleminds, Victorious Maiden 2 and posted in fiction. You can follow any responses to this entry through the RSS 2.0 feed. Oya is the kind of baddie I really enjoy reading. Love it!